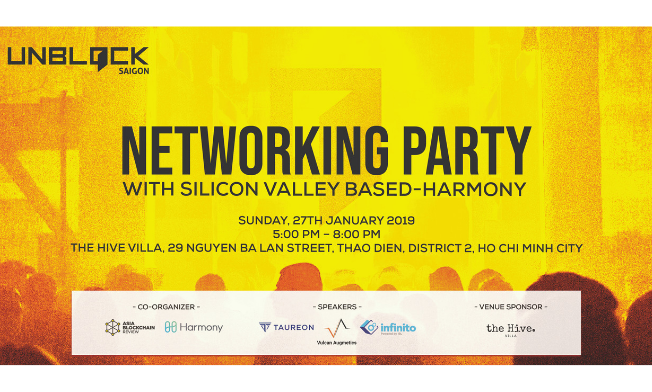 On January 27th, Asia Blockchain Review is pleased to host Silicon Valley-based Harmony at a meetup “Unblock Saigon”, Vietnam. The meetup brings an opportunity for global blockchain players to meet Harmony’s founder and CEO Stephen Tse. Harmony is a research-proven open and scalable Marketplace for future’s decentralized Economy. It stands as an innovative initiative that enhances the scalability of blockchain by using advanced consensus protocols, transport networks, and system tooling. The audience is all set to be enthralled by the presence of Stephen Tse, Founder & CEO of Harmony as he talks about his vision and the paradigm shift blockchain is about to bring. Mr. Tse is equally excited to talk to the local players about the next big tech disruption and share the blockchain landscape insights from Silicon Valley. A rich panel of speakers for the event include leaders and partners from Infinito, Vulcan Augmetics, Taureon Capital and Bitcoin Vietnam. Our speakers will be exploring through various aspects of “Scalability and Solutions in Blockchain: Use Case Robotics and Decentralization” over a panel discussion. All speakers will bring their deep understanding of the blockchain landscape from a diverse perspective to the meetup. As the Founder & CEO of Harmony, a Silicon Valley-based blockchain startup, Stephen Tse holds a Ph.D. in security protocols. Stephen was handling large-scale infrastructure projects at Google and as a principal engineer at Apple. He developed the social search engine Spotsetter that was later acquired by Apple. With his project, Harmony Stephen wants to scale smart contracts to a global level to spark unimagined innovation without scalability challenges. At the meetup, he will be sharing his views on how the once in a decade technology shift is about to make a big difference in Silicon Valley. As an IT expert with specialization in the blockchain, Fedor Bushlanov exercises oversight on business development and sales. His 10 years of experience is diversified over the spheres of blockchain and digital video. With profound knowledge of blockchain technology, Fedor develops business strategies for international B2B marketing and sales. He specializes in the introduction of the product to the market and new market penetration strategy building. Fedor utilizes his expertise to guide blockchain startups to analyze key market trends and develop strategic long term partnerships. Co-Founder & CEO of Vulcan Augmetics aims to help the society with affordable, upgradable and modular prosthetics. Vulcan Augmetic is utilizing mix-production method, 3D printing and modular approach to bridge the gap between what technology can do for humans with limitations. Rafael has been interested in blockchain and cryptocurrencies since 2013 and is a published author of some buyer guides and runs an educative Facebook group CryptoStarters. Tom is a partner of Taureon Capital, a leading consulting firm focused on advancing distributed ledger technology startups. Supporting early-stage company growth, Taureon Capital is a team of angel investors, technologists, and financers. Tom has been investing in cryptocurrency since 2013 and is the founder of the Block Republic angel investor community. He is also on the advisory board of innovative blockchain startups like Prasaga, Peer Mountain, Fysical, Gamedex, and CoinFi. Tomo is an internet technologist who loves to work with startups and has been an active participant in the development of the Vietnamese startup ecosystem including the blockchain landscape. Working with the oldest Bitcoin exchange – BitcoinVN in Vietnam, he is a part of the local Bitcoin community in Saigon. We hope to see you on January 27th, at “The Hive Villa”- the Venue Sponsor of the meetup. Looking forward to some enriching sessions and in-depth discussions for the fellow players of blockchain landscape. It is a great networking opportunity! Unblock Saigon is a monthly initiative organized by Asia Blockchain Review to strengthen the blockchain community in Vietnam. The meetup series of Unblock Saigon focuses on the latest topics of blockchain across the globe from both technology and adoption perspective. Connecting blockchain enthusiasts across the globe, Asia Blockchain Review conducts discussions lead by industry leaders, technical workshops and consulting programs. Saigon blockchain community is bringing the stakeholders and local blockchain together with the “Unblock Saigon” series of meetups where ideas will be shared and a stronger community will be fostered with networking. This upcoming Unblock Saigon meetup will bring together local and global blockchain players to explore what can be attained using blockchain.